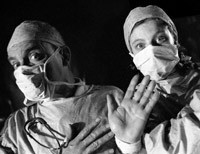 Free for All was based on extensive video recordings with pioneers who fought to establish the original National Health Service, with present-day NHS workers and users, and with campaigners fighting to defend the service from privatization. The show revisited the hopes and dreams of 50 years ago to ask key questions about the future of this unique institution. 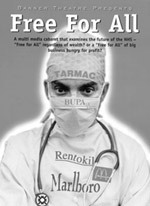 Using song, drama, music and digital video technology, the show explored whether the original principle of the NHS – free for everyone – had become a different kind of “free-for-all”, involving transnational drug companies, private health care businesses and ever more elaborate schemes of privatization.